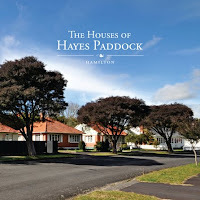 Following the success of two earlier books in this format, Heritage Hamilton and the Baches of Raglan, Ramp Press, (the publishing wing of Wintec), has recently published The Houses of Hayes Paddock - in partnership with the Hamilton City Council. Hayes Paddock was one of the first state housing communities built by the first Labour Government, although only a relatively few homes now remain in Housing Corp ownership. This most attractive 128 page book, with over 120 photos, reflects a unique community, which now has protection through a heritage cover. Work on the book was undertaken by student photographer Anne Challinor, designed by Jaimee Ballard who graduated from Wintec last year, with an essay by visiting Wintec historian, Dr Ann McEwan. The book provides a most interesting piece of social history and is a credit to all involved. 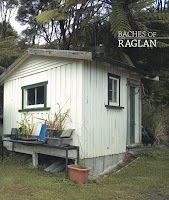 The book is about Raglan’s older Baches, many of which were built in the boom years of the 50s and 60s. Others were much older and have been handed down through families with long connections to the Raglan community. Built of wood, concrete or fibrolite with iron roofs, they remain largely unaltered. The book tells the stories of people who have “a place at the beach” and an affection for a simple life.Baches of Raglan is the work of students and lecturers from the Wintec School of Media Arts. Review by The Lumiere Reader here. To my shame I have never been to Raglan but having spent nearly two hours reading through this handsome soft-covered publication and looking at the great photos I have decided that a weekend down there is a must. I wonder if one could rent one of the featured baches?